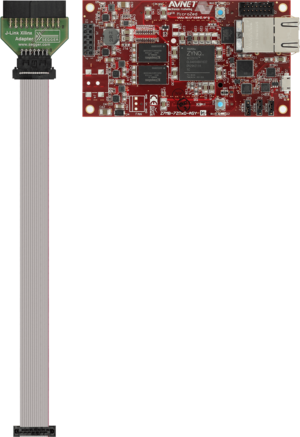 The Xilinx MicroZed is a complete development kit for the Xilinx Zynq7000 SoC. The Xilinx Zynq7000 is a high-end SoC which incorporates a dual core Cortex-A9 (2x Cortex-A9) and programmable FPGA logic on-chip. The MicroZed provides a Xilinx specific 14-pin debug connector. In order to connect J-Link to this board, the J-Link Xilinx adapter is needed. 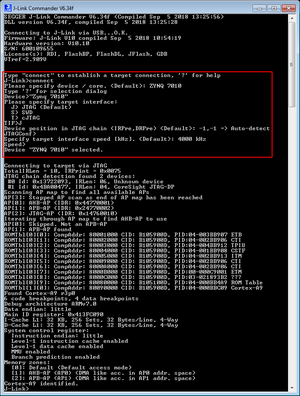 Note: For the 1st connection we recommend to not insert any microSD card to make sure that no potentially problematic application is booted by the Zynq device. Problematic applications can be ones that enter low power states that make the core non-responsive to debug requests from J-Link. Note: VTref shown in J-Link Commander should be 2.85V - 3.0V. If it is significantly lower, a wiring problem is likely. The MicroZed has been tested with the following jumper settings on the board. Other jumper settings have not been tested and are not guaranteed to function properly for debug. This page was last modified on 1 October 2018, at 18:31.